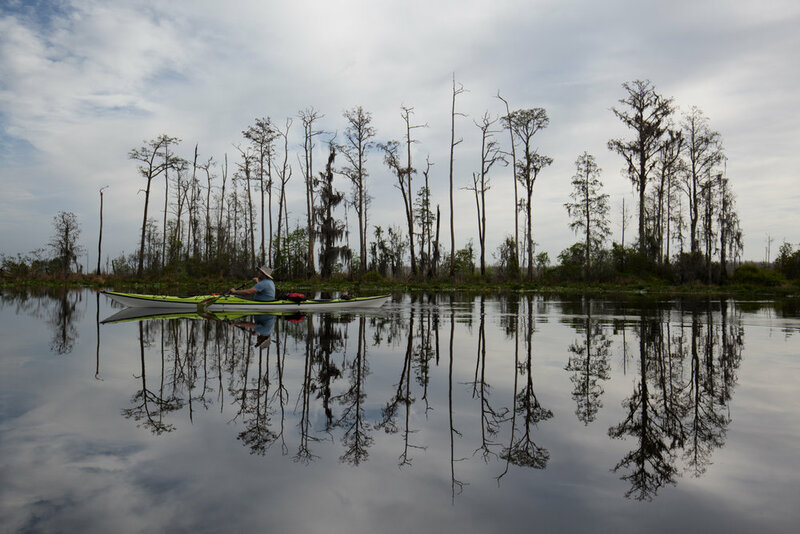 The moss-cloaked trees reflect on the glassy surface of the headwaters of the Suwannee River, the trees delineating the horizon and it feels like we’re paddling in a still image, floating on the blue sky colored water reflecting a parallel world. Our kayaks slice through the water and only our wake disturbs the stillness, the ripples long and undulating. We can hear a low, rumbling growl, best described like a deep and prolonged guttural belch coming from ahead of us. Barry and I look at each other, the hairs on the back of my neck stand on end, and against my instinct to flee, curiosity cautiously propels me toward the source of the sound. Ahead of us I can see large alligators cutting through the water, crisscrossing our path like a classic arcade game of Pong. 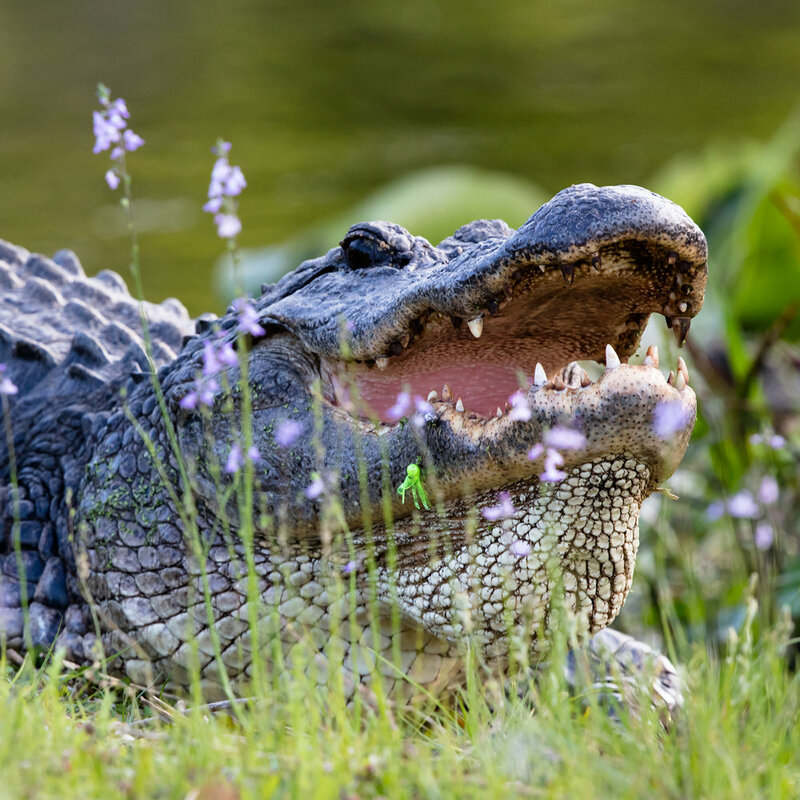 The low, primordial growling sound in the early hours on this spring morning is coming from them – it is the beginning of the mating season for these American Alligators. 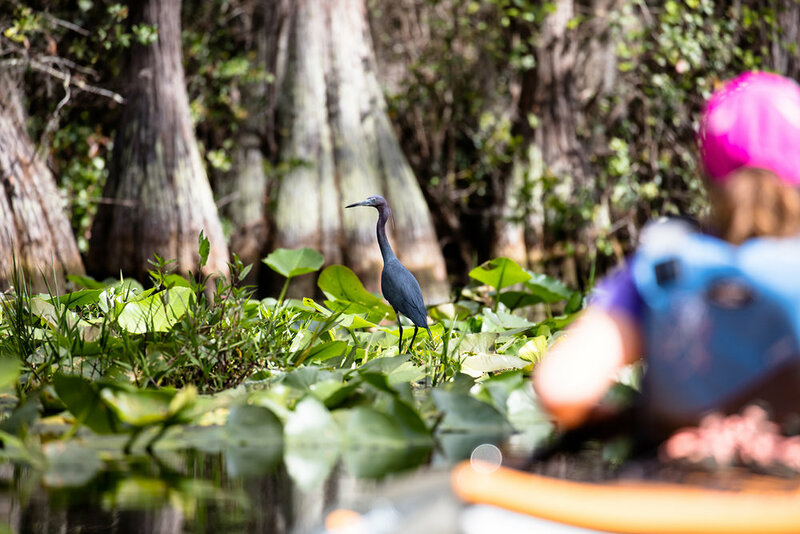 This is our second kayaking foray into the Okefenokee Swamp (link to Please Don't Feed the Alligators), this time we’ve put in at Stephen C. Foster State Park, named after the composer of the famed song Swanee River, and located a few miles from Fargo, GA. 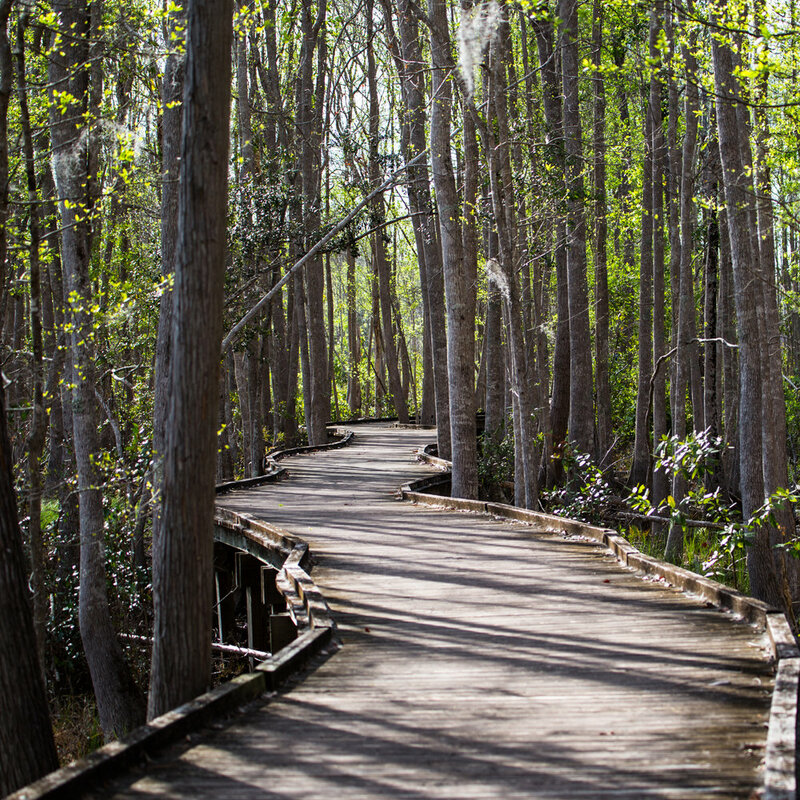 The park is part of the National Wildlife Refuge, home to an estimated 12,000 alligators, some of which can be spotted sunning themselves on the edge of the river, completely indifferent to our presence. 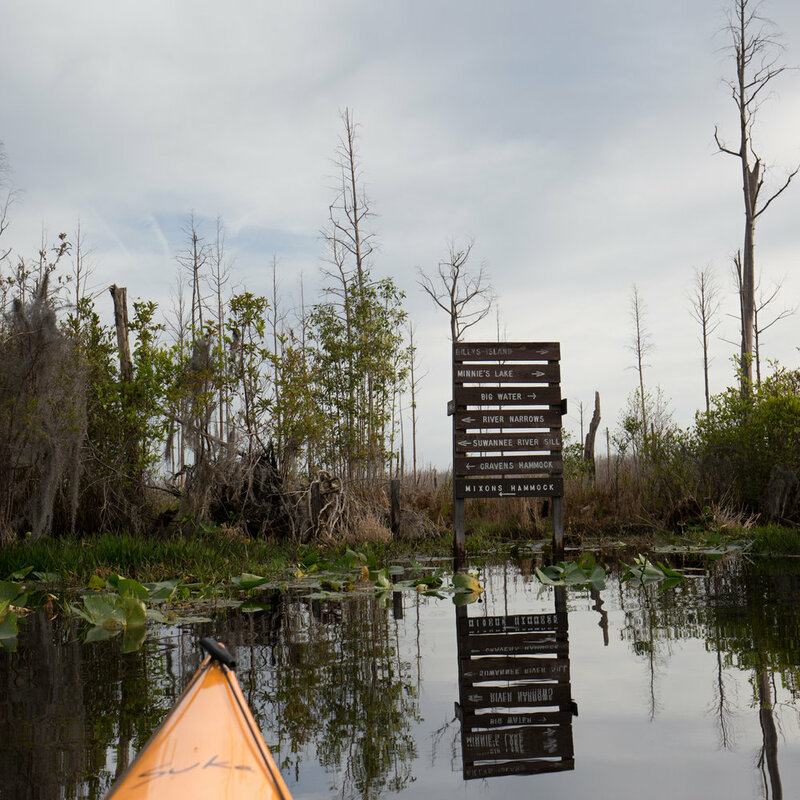 As we paddle further, our eyes become trained for spotting alligators. Some slowly submerge into the water as we approach, leaving only their eyes and nostrils visible above the water, others slowly swim to the river’s edge, their armored bodies swishing through the water in an unhurried manner, and others, maybe caught off guard, plunge into the water with a big splash, causing me to jerk my paddle up in the air, a natural reaction to the unlikely scenario of being snatched into the water. 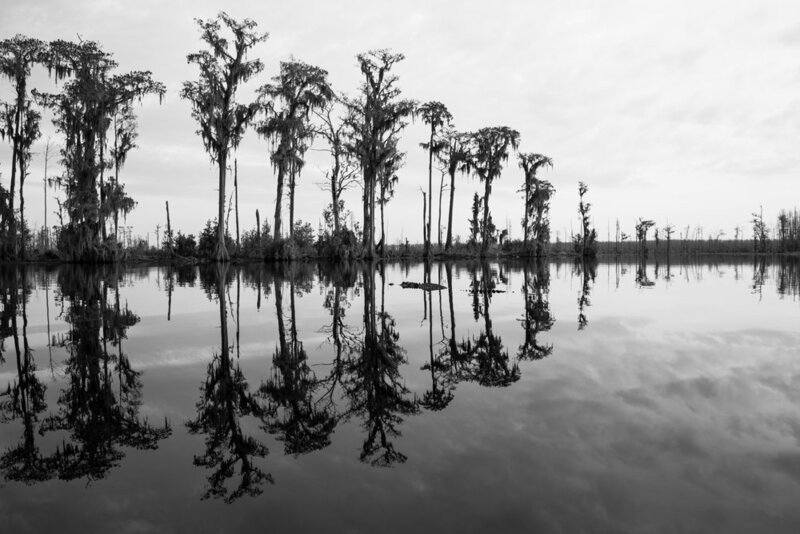 We maneuver our pointy ocean kayaks around the large bases of submerged trees, the cypress knees tucked close to their trunks. The water is swift as we paddle up stream toward Big Water Lake in what the interpretive map aptly refers to as ‘Pinball Alley’. After several hours kayaking, we pull up to a rest shelter to stretch our legs. The shelter is a platform with a covered picnic area and an outhouse and is similar to the camping setups within the refuge’s extensive waterways. Presumably alligators can’t walk up steps? It is, however, with some comfort that we spot a water snake curled in the vegetation just below the platform. I’m still not brave enough to camp in this wilderness, give me a bear encounter any day over a cold-blooded snake slithering in my sleeping bag seeking warmth. The way back to the park headquarters was much quicker as we drift with the current – occasionally skewering the bow of our kayaks into the thick lily pads for a better view of the alligators and turtles sunning on the riverbank, or to watch the herons, egrets and ibises pick through the lush green foliage for snails, insects and frogs. I focus my lens on one alligator as it glides through the water. Looking up from my camera, I realize that the alligator has crossed my path much closer than I’m comfortable with – the wide-angle lens skews the perspective and objects are definitely much closer than they appear. The next morning we encounter a huge alligator along the edge of the river. Again, it is unperturbed by our presence. Other visitors refer to this alligator by name. Apparently that’s Sophie, distinguished by the bright green fishing lure pierced in her jaw – the lead weight is visible just below her teeth. The park interpreters have clearly done a good job of humanizing these predators in an effort to protect them and their threatened habitat. I had seen these women on the tour boat while paddling, even joked with them on who would win in a kayak/alligator encounter. To see them swoon over this alligator was a testament to the park rangers’ efforts to engage and educate people about conservation efforts. These kayak trips are vastly different from our past trips through Ontario’s lakes and rivers. 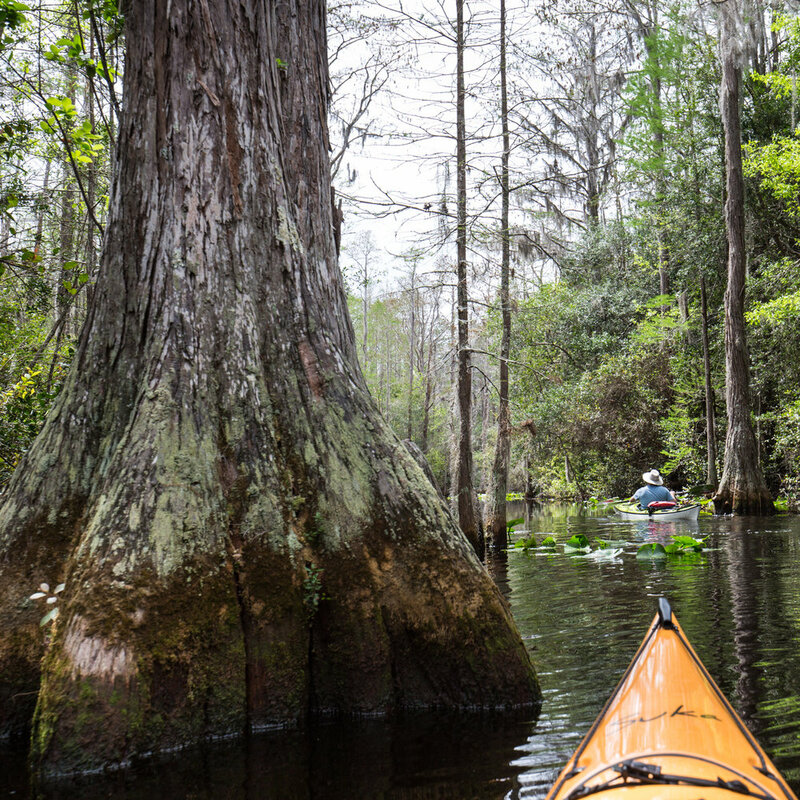 Paddling through a forest of cypress trees and encountering alligators is one of the most unique experiences living in the South. 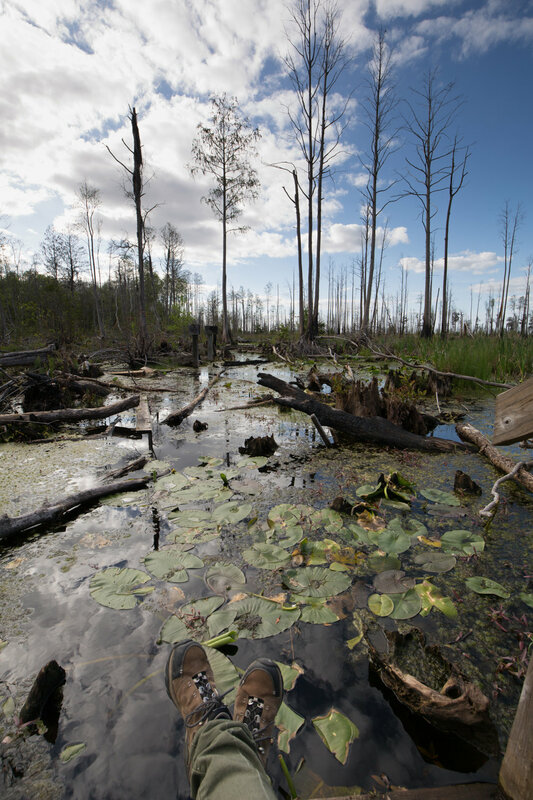 Weaving between a forest of trees and exploring this habitat reveals a rich and diverse world that is far beyond any stereotypical perceptions of a mosquito-infested backwater and I look forward to exploring more of these swamps while we've got access to these rich waterways. Sights and sounds from a paddle through the Okefenokee National Wildlife Refuge near Fargo, GA. You can hear the alligators bellow in the first clip while kayking in Stephen C. Foster State Park.